NATO Defends Accuracy of Satellite Images With Additional Proof NATO-ACO 11 Apr 2014 -- Supreme Headquarters Allied Powers Europe (SHAPE) defends the accuracy of the images (found below) that were released to media on Thursday, 10 April 2014. Russia with Ukraine is an empire. 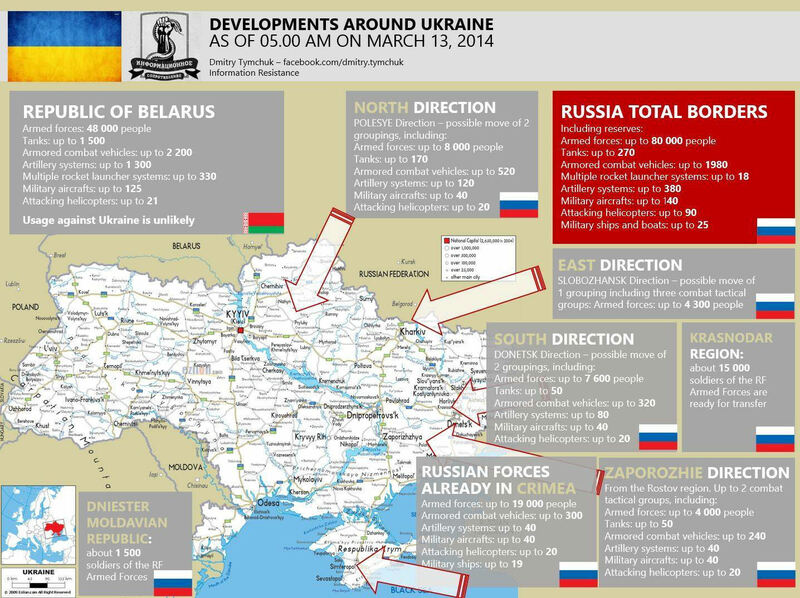 Russia began a slow-motion occupation of Ukraine in April 2014. In the face of insurrections by pro-Russian protesters that spread like wildfire through eastern Ukraine, local security forces either melted away or, in some places, swapped sides and joined the protesters. "We did not expect that the whole system of central and regional power would fall to pieces so quickly," Acting President Oleksander Turchinov said. Federalization supporters in Donetsk, Druzkivka, Gorlovka, Kharkiv, Kramatorsk, Luhans'k, Makiyivka, Melitopol, and Slaviansk seized local adminstration buildings, and refused to recognize the legitimacy of the current Ukrainian government. In March, Russia’s Defense Ministry launched artillery drills in the southern military district, which involved some 8,500 troops and a large amount of hardware. It coincided with war games conducted by the country’s Airborne Troops. Russia repeatedly denied any troop build-up on the borders with Ukraine, as well as plans to send any troops into Ukraine. 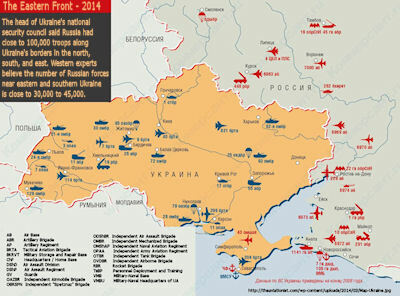 "Russia's main objective with regard to Ukraine is to disrupt early presidential elections in the country, and the risk of incursion of Russian troops into the mainland Ukraine is very high," National Security and Defence Council Secretary Andriy Parubiy said during a 27 March 2014 web conference with Damon Wilson, Executive Vice President of the U.S. Atlantic Council. According to Parubiy, the available data indicate that the annexation of Crimea was the first stage of Russia's plan of invasion of Ukraine, codenamed "Russian Spring". "The next stage should have been eight southeastern and eastern regions of Ukraine where they planned a scenario identical to that in Crimea, for the seizure of regional state administrations, public institutions, the proclamation of so-called "people's governors", and then an appeal to Russia for help," Parubiy said. According to him, the numerical strength of Russian troops deployed near Ukraine's northern and eastern borders exceeds 100,000. "Russian troops were supposed to be welcome in the east and south of Ukraine, but well-prepared protests have failed to receive wide popular support there. Now, along with the amassment of troops, they are employing a long-term political strategy to disrupt the Ukrainian elections. We are aware of the highly probably attack on the mainland territory of Ukraine and we are preparing for it. Our general strategy now is to ensure public order, avoid provocations, and prepare for the May 25th presidential election," Parubiy said. So far, there has been no progress in negotiations between Ukraine and Russia. "The sides are holding consultations and issues to be raised at a meeting between the Russian and Ukrainian deputy foreign ministers," Russian Deputy Foreign Minister Grigoriy Karasin told reporters. He said it was too early to speak about any concrete date or venue for the meeting. The arrest in Kyiv in late March 2014 of an ethnic Russian pan-nationalist accused of recruiting dozens of paid recruits to storm the Ukrainian parliament fuelled allegations here that Russia is preparing so-called “provocations” designed to destabilize Ukraine. The country’s new leaders accused the Kremlin for weeks of instigating and encouraging pro-Russian political unrest along the eastern border. They said Kremlin-encouraged provocateurs had been stirring up opposition to the ouster of former President Viktor Yanukovych and fomenting protests by groups of ethnic Russians campaigning to follow Crimea, the Black Sea peninsula Russia absorbed. The clandestine “active measures” are reminiscent of Russian intelligence activity in the Republic of Georgia following that country’s 2005 Rose Revolution, they claim, and could be a prelude of a Russian military incursion into Ukraine. NATO's secretary-general said 1 April 2014 that he'd seen no evidence that Russia is withdrawing its forces from the border with Ukraine. "Unfortunately, I cannot confirm that Russia is withdrawing its troops,'' Anders Fogh Rasmussen told reporters ahead of the NATO meeting in Brussels. So far, NATO had increased air patrols over the Baltics and the United States is planning more intense military exercises with Poland. 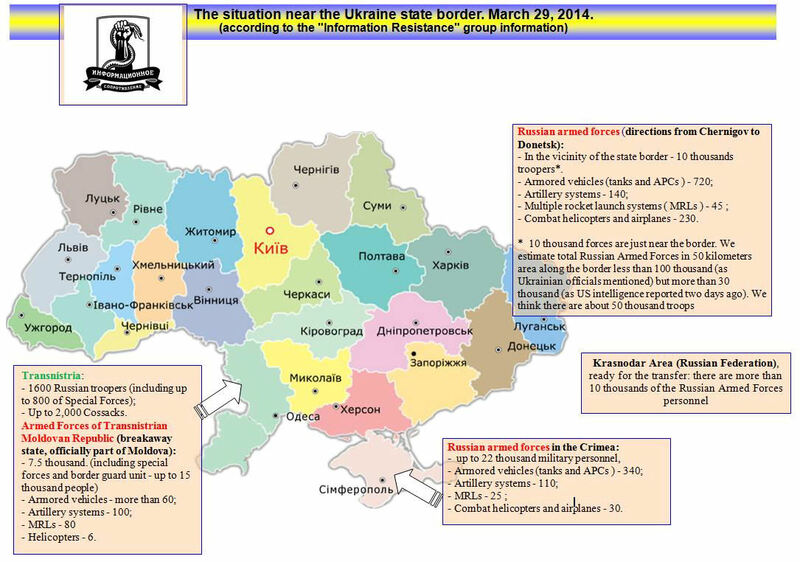 US and European security agencies estimated 27 March 2014 Russia had deployed military and militia units totaling 30,000 to 45,000 people along its border with eastern Ukraine. 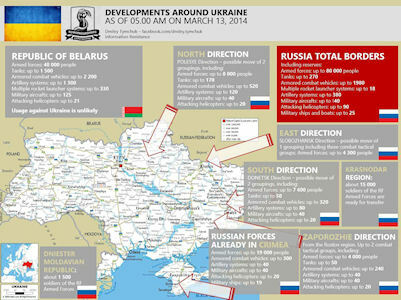 The current estimates represent what officials on both sides of the Atlantic describe as a continuing influx of Russian forces along the Ukraine frontier. according to a U.S. assessment of the situation, the likelihood of a Russian incursion into eastern parts of Ukraine is now greater than it has been before. The officials have been quoted as having seen several worrying signs in the past three to four days. Countering Moscow's claims that Russian troops positioned near the border with Ukraine are conducting routine military exercises, the Pentagon says that there is no indication supporting that. "They continue to reinforce, and it continues to be unclear what exactly the intent there is... We've seen no specific indications that exercises are taking place," said Pentagon Press Secretary Rear Admiral John Kirby on Thursday. An incursion into eastern Ukraine, if deep enough, could enable Russia to establish a land connection to Crimea. Currently, Russia has access to the Black Sea peninsula only by air and sea. From local sources, VOA learned that the Russian military has established a field hospital in the Bryansk region, about 20 kilometers from the Russia-Ukraine border, that some 60 train cars have arrived near the border with supplies and that the frontier is being patrolled by more than a dozen Russian drones. Russia had significantly stepped up its military presence in the Black and Azov Seas, the State Border Service of Ukraine reported. "The State Border Service of Ukraine has said that recently Russia has significantly increased its military presence in the Black and Azov Seas. The ships and boats and the Russian coast guard and fleet are conducting acting maneuvers," reads the statement. Three ships of the Russian Black Sea Fleet and three support vessels of Chornomornaftogaz were spotted in the northwestern part of the Black Sea. Chornomornaftogaz ships flying the flag of the Russian Federation are based near offshore fixed platforms. Two more ships of the Russian Black Sea Fleet were in the western part of the Sea of Azov. "All vessels were moving in international waters and at a substantial distance from the outer boundary of Ukraine's territorial waters," reads the statement. NSDC Deputy Secretary Viktoria Siumar said "With regard to Transnistria and threats in that direction, the situation is quite threatening. According to our data, Russia pays special attention to this region, and it's all done for the purpose of organizing riots in Odesa ..." Russia is preparing to organize riots through Transnistria in Odesa and thus create a "security belt for Crimea", Deputy Secretary of the National Security and Defence Council (NSDC) Viktoria Siumar briefed the press at the Ukraine Crisis Media Center on Thursday in Kyiv. In case of emergencies, bomb-shelters in Kyiv have enough space for all residents and guests of the city, Head of Kyiv City State Administration (KCSA) said this at an off-site meeting. "All the conditions [in air-raid shelters in the capital - ed.] in Kyiv are provided for half million people," Bondarenko said. "If we talk about a system that relates to the underground space of the Kyiv Metro and underground parking sites, 100% of Kyiv residents can be accommodated there," Bondarenko noted. Earlier it was reported that in Kyiv there are 526 bomb shelters. Of them 299 are in the municipal ownership of the city and another 124 are owned by private entities (factories and enterprises). Ukraine's armed forces will act if Russian military intervention escalates any further into Ukraine's territory, Prime Minister Yatsenyuk told a news conference on 06 March 2014. “In case of further escalation and military intervention into the Ukrainian territory by foreign forces, the Ukrainian government and Ukrainian military will act in accordance with the constitution and laws,” Yatsenyuk said in Brussels. “We are ready to protect our country,” he said. Ukrainian forces have so far not responded to the Russian takeover of the Crimean peninsula. But this could change if the Russian intervention escalated, he said. Aside from the early defection of Ukraine’s navy chief Denys Berezovky, who swore allegiance to pro-Russian leaders in Crimea the day after he had been appointed as head of the navy by Kyiv authorities, the Ukrainian military has remained loyal to the interim Ukrainian government. Russian appeals to Ukrainian navy and army personnel in Crimea to switch sides have fallen on deaf ears, even when military installations have been overrun. Russian President Vladimir Putin said the Russian and Ukrainian military will not engage in a confrontation and will be on the same side. "I am confident that the Ukrainian military and the Russian military will not be on different sides of the barricades, they will be on the same side of the barricades," Putin told reporters on 04 March 2014. Putin said there is currently no need to send Russian troops to Ukraine. "As to the sending of troops, there is currently no such need," Putin told reporters. "However, there is such a possibility," he said. 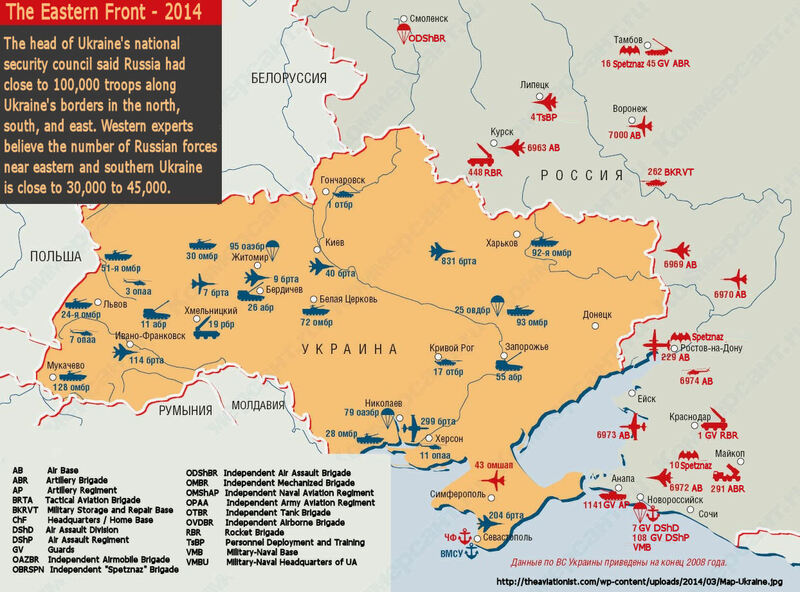 Russian forces may be used in Ukraine under extreme circumstances only. The Russian parliament's approval 01 March 2014 of the use of armed forces in Ukraine does not mean it will happen immediately, Russian Deputy Foreign Minister Grigory Karasin said. "Today's consent ... means only that the president has the free hand [to act] if the situation gets worse," the Russian news agency quoted Karasin as saying. "I am convinced that it [decision] will be understood correctly in Ukraine, but I do not rule out that it will be distorted as always by Western mass media which barely understand the processes unfolding in Ukraine both now and before." Russian President Vladimir Putin told US President Barack Obama by telephone that Moscow reserves the right to protect its interests and those of Russian speakers in Ukraine, the Kremlin said. "In response to the concern shown by Obama about the plans for the possible use of Russia's armed forces on the territory of Ukraine, Putin drew attention to the provocative, criminal actions by ultra-nationalists, in essence encouraged by the current authorities in Kiev," the Kremlin statement said. Under one scenario, Russian units would move into Crimea and possibly Eastern and Southern Ukraine to safeguard Russian citizens and military infrastructure (in the case of Crimea). They would not confront the Ukrainian military unless fired upon and would not move past their zone of deployment unless provoked. 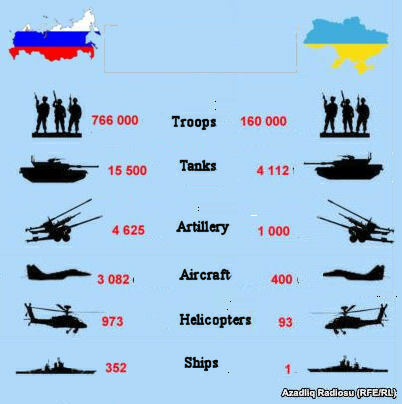 The Ukrainian military (the units that do not desert or mutiny) or Maidan-Nazi irregulars would likely attack Russia's forces, logistics, or citizens, providing a pretext to take the battle to Kiev to oust the coup-making Banderites. Should the above occur, the US is unable to directly intervene because it has no substantial units in that theater. Instead, it would ‘Lead from Behind’ through a Polish-led NATO push into Western Ukraine to 'meet Russia in the middle', save it what can from its failed fascist fantasy, and would not directly attack Russian forces. This would also serve the dual purpose of de-facto resurrecting the Polish-Lithuanian Commonwealth in Western Ukraine. Interim Ukrainian president Aleksandr Turchinov placed Ukraine's military on high alert in response to Russia's possible military intervention in Ukraine. "All explanations about dangers to Russian citizens or Russian-speaking Ukrainians have been devised," he said in response to Russia's threat to deploy its military in Crimea to protect its citizens. "After the decision by the Federation Council, the president has received the full arsenal of means needed to resolve the situation, in terms of using (military) forces and in terms of taking decisions about (withdrawing) the head of our diplomatic mission in the United States," Putin's spokesperson Dmitry Peskov was cited as saying. US President Barack Obama's warning that Russia would have to pay for a planned military intervention in Crimea is "a direct threat," Federation Council Deputy Chairman Yury Vorobyov said, addingn that Obama had "crossed the red line and insulted the Russian people.... Yesterday we heard from various media sources that the US president, Obama, had said Russia would pay dearly for its policy. We know that Maidan militants who were active in Kiev, and not only there, had been trained in Lithuania and Poland. Now they want to spread their influence with their activities to eastern regions of Ukraine and Crimea," Vorobyov said at an upper house session. Head of the Ukrainian Association of Political Sciences, Valery Bebik, believed that "There are inspirations, both on the part of Russia and the EU. Ukraine has become a communications courtyard for intelligence agencies, which are pulling all the strings through provocateurs". Putin's adviser on regional integration, Sergei Glazyev claimed 06 February 2014 that Russia had legal grounds to intervene in Ukraine, citing the 1994 Budapest Memorandum on Security Assurances, which named the United States and Russia as the guarantors of Ukraine's sovereignty and territorial integrity. He did not specify how Russia might intervene in Ukraine. Glazyev also accused the United States of financing and arming Ukraine's "opposition and rebels." In an interview with the newspaper Kommersant-Ukraine published 06 February 2014, Glazyev alleged that U.S. "sources" were spending $20 million a week to provide such financing, including for weapons, and that Ukrainian anti-government militants are being trained "on the territory of the American embassy" in Kyiv. Glazyev accused the United States of "unilaterally and crudely interfering in Ukraine's internal affairs." Moscow and Beijing condemned any attempts at external interference in the situation in Ukraine, the Russian president's spokesman Dmitry Peskov said 06 February 2014. "Both parties have emphasized the unacceptability of any interference from the outside in what is happening and a very serious condemnation of such interference has been voiced," Peskov told reporters following the talks between Russian President Vladimir Putin and Chinese leader Xi Jinping. Moscow reiterated that the worsening situation in downtown Kiev was a result of Western interference in the country’s politics, according to a statement by the Russian Foreign Ministry. Moscow believes that the aggravation of the situation in central Kiev is the result of a connivance policy on the part of Western politicians who turn a blind eye to the aggressive tactics of radical forces in Ukraine. A Russian Foreign Ministry statement read. "What is happening is a direct result of the connivance policy on the part of those Western politicians and European bodies which, from the very beginning of the crisis, turn a blind eye to the aggressive actions of radical forces in Ukraine, thereby encouraging their escalation and provocations in relation to the legitimate authorities". Head of the Duma Committee on Foreign Affairs Alexei Pushkov supported the standpoint that Ukraine should not be forced to choose between Russia and the EU. "It seems to me that we could take as a basis the statement of Chancellor Angela Merkel, who said that Ukraine should not be put before a choice - either the EU or Russia. I absolutely agree with that," Pushkov said during Moscow-Berlin videoconference 18 February 2014. If the Ukraine is put before this choice, then "we will get a divided country," he stated. "We must find such a way for the Ukraine to complete the integration process with the European Union, that will allow us to preserve current relations between Ukraine and Russia. These relations are now quite important for the Ukrainian economy. This will be the best choice, I suppose," the head of Duma Committee said. The attempts made by some Western politicians to blame Russia for the current situation in Ukraine are unacceptable, Russian Foreign Minister Sergei Lavrov said 19 February 2014. "They are now trying to blame us, accusations are made by some politicians in Western countries, who say that Russia is to blame for everything because it is trying to 're-Sovietize' the post-Soviet space". Ukraine should not repeat "the Yugoslavian scenario" and events in this country are occurring at the instigation of the West, which continues to pursue its geopolitical goals, the Chairman of the Russian Duma Committee for CIS and Eurasian Integration Leonid Slutsky said 19 February 2014. "It is necessary to stop by any means the bloodshed and not permit outside intervention". All this is happening "at the instigation of the West which continues to pursue its geopolitical goals and could not care less about the fate of the whole country and its people," the politician said. Russia is ready to provide whatever help is necessary and requested by the fraternal nation, Slutsky said. The US implemented visa sanctions against 20 Ukrainian officials, the State Department said 19 February 2014, adding that it believes those individuals are responsible for the use of violence. If the visa sanctions are not enough, the US will be ready for further steps in coordination with the EU to stop the violence in Ukraine, Reuters quoted a senior State Department official as saying. "Today we moved to restrict visas to some 20 senior members of the Ukrainian government and other individuals we consider responsible for ordering human rights abuses related to political oppression in Ukraine," the official said. European Council President Herman Van Rompuy said on 01 February 2014 that the offer of closer cooperation between the EU and Ukraine still stands. "The offer is still there. And we know time is on our side. The future of Ukraine belongs with the European Union," he said at the Munich Security Conference.